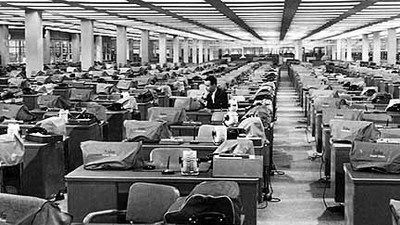 The Open office plan circa 1960. A modern office resembles the dark vision of Jean-Paul Sartre’. In his play “No Exit,” he traps three characters in a room. The characters psychologically torment each other. The lights never dim and no one can escape. To Sartre’, “hell is…other people,” and they are impossible to escape. It sounds like a perfect description of the modern office with cubicles and open floor plans. By design or neglect, the contemporary office has become a toxic hell which white collar workers navigate each day. As an agile coach and scrum master, you need to fight this toxicity and make work better. The open office is not a new concept. As business expanded, hundreds of people were needed to perform necessary clerical work. Captains of industry required contracts typed, checks deposited, and in a time before computers numbers crunched. Many of these jobs became obsolete with the advent of computers and photocopy machines. Today, an employee with a laptop can be more productive than an entire 1950’s office pool. It is impressive when you think about how office work has changed over the last seventy-five years. It is also surprising how little has changed. Alcohol abuse is still a problem in the corporate world. The “Peter Principle” which promotes people to their level of incompetence is still in practice. Finally, according to Gallup, two-thirds of workers in the United States are disengaged. I feel strongly Agile came into being because competent, hardworking people thought it was possible to do better. The reason offices converted too open plans is the combination of perverse economic incentives and naive notions of what it takes to build a collaborative team. In cities with large business communities, rent is at a premium. In Chicago rent increased by 20% in 2016 and currently leases at $50 to $60 a square foot. Based on the price pressure, business owners have the incentive to get the maximum amount of use out of each square foot. The open office makes that possible and managers can squeeze more people into less space. The open office plan began with Frank Lloyd Wright and his Johnson Wax office building; it also has an origin in German design from the 1950’s. The open office would facilitate conversations, collaboration, and innovation. The reality of open offices is an environment employee’s loath. It does not help the shareholder value theory of business motivates many managers. To these managers, the only thing which matters in increasing the share price or dividend for the company stockholders. Thus, the open office and the shareholder model of business creates a fiendish replication of Sartre’s hell. We are trapped economically in a space which is designed to torment us. It is this combination of poor work environment and leadership which ignores stakeholders, customers, and employees are why I think we have such a severe problem with disengagement and alcohol abuse in office culture. When there is a disconnect between your work and your wellbeing, something has to give; for many, it is their self-esteem and enthusiasm for work. Marxist philosophers call this “Labor alienation,” and it is just as bad today as during the sweatshops of Dickens. Agile came into being because people doing the work of building the world economy through there was a better way. These people were project managers and technologists. None of them were Fortune 500 executives. Individuals and interactions, responding to change, customers collaboration, and working systems were more important than everything else at the office and embracing these values we say we are trying to make the office less toxic. Many of us feel we are powerless to change things in the office. Agile gives us the tools to expose dysfunction and reduce alienation. We have to be brave and smart enough to use those tools; otherwise, we will continue to have the same office as we have had for seventy-five years and there will be "no exit," for us. No secrets on an agile team.